On July 18th, a woman was badly beaten by her boyfriend on Shin-dang Street. In the same month, Iron; a Korean rapper, was found guilty of dating abuse. As these cases show, dating abuse has been splashed across the headlines of many newspapers. The phrase ‘dating abuse’ is quite contradictory. It is an awkward combination of the word ‘dating’, which is supposed to indicate affection, and ‘abuse’, which implies violence. According to the Korean National Police Department, the average number of annual dating abuse cases reported amounts to 7,300 in recent five years. This means 20 victims suffered each day. While the police endeavors to deal with the problem, they face difficulties due to current laws. Dating abuse is hard to prosecute because it is often perceived as a personal problem rather than a crime. Moreover, the media seems to be reinforcing the stereotype that all perpetrators are men when in fact; men can be victims of dating abuse as well (especially in verbal and psychological violence). However, when debating this matter, there should be a clear understanding on the definition of ‘dating abuse’. According to a research paper by YouLee Hwa-young, the head of the Sexual Violence Counseling Center in Korea Women’s Hot Line (KWHL), dating abuse refers to physical, verbal, sexual, and financial abuse or controlling behavior in the relationship where people are or were romantically interested in each other. To examine the definition above in detail, the diverse categories of dating abuse share the aspect of ‘dominance over another’, in which the term ‘dominance’ refers to the feeling of possession. 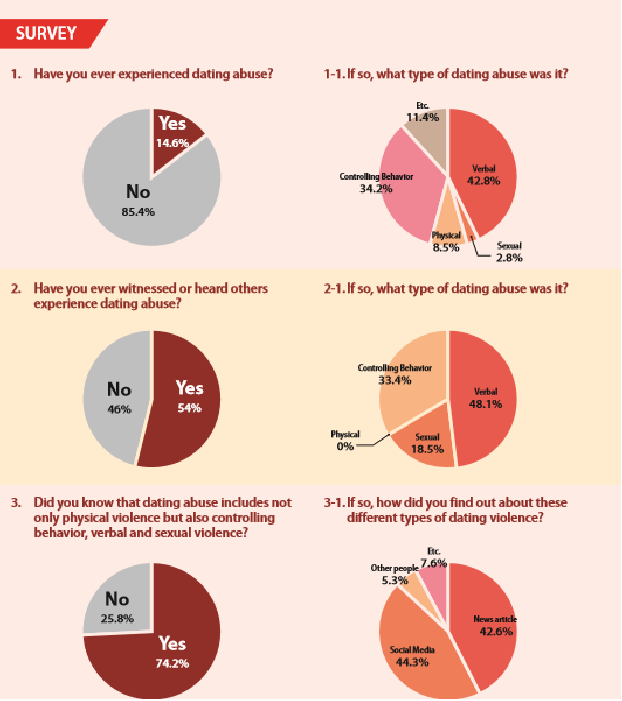 With this feature in mind, ultimately, people should be fully aware of other categories of dating abuse. Fixed gender roles and unequal power given to each gender in a relationship are the main reasons for dating abuse within the Korean society. Byun Sinwon, a Professor at the Korean Institute for Gender Equality Promotion and Education said, “Men have been under obligations to succeed and support their families. As society consolidates the stereotype more than changing it, they often turn their hatred towards women.” In the same vein, men are reluctant to report dating abuse to the police due to the socially enforced masculinity. Overall, the Korean society itself is causing and exacerbating dating abuse. Recent reports in the press have generated intensified public concerns over dating abuse, but people still have little to no understanding of how to cope with it. Professor Park said, “The problem is that we have never been educated about dating abuse in our society. Rather, we have been taught to withstand obsession and control by considering such abuse as signals of flirtatious behavior.” Korean movies and dramas describe unilateral touches or controlling behaviors as signs of romance. Viewers are exposed to this dating culture without realizing the real problem behind “pushing someone into a wall” (a common act that is seen in Korean melodramas). Korea is still suffering from the absence of an organized law system regarding this issue. Although gender violence could lead to a secondary crime, the present law system does not do much to protect the victims and punish the perpetrators. In Korea, stalking, which is a type of dating abuse, without threats or housebreakings is treated as misdemeanor. It goes to the continuous harassment of the Minor Offenses Act only punishing the perpetrators by a fine of one hundred thousand won or less. However, the situation is quite different elsewhere. England and Wales, for instance, created the‘Clare’s Law’ in order to prevent potential domestic abuse. The law allows anyone to apply for the disclosure of their partner’s abusive past. The law is named after Clare Woody who was murdered by her former partner who had a history of violence. Without any legal regulations, it is difficult to protect victims from the offenders. Many have acknowledged this fact with countries enforcing related laws worldwide. Family violence laws, for instance, can enforce temporary measures to physically separate perpetrators from the victims. According to the thesis, ‘A Study on Punishment of Dating Violence’ by Kim Seon-hyub, the US initially only provided a ‘protection order’ for domestic abuse victims. However, the US is now expanding the range of the protection order to make sure that it applies to dating abuse as well. Professor Lee Ho-yong of the Department of Policy Studies of Hanyang University (HYU) said, “It is important to provide the victims or potential victims with legal backgrounds for their safety.” For the protection of victims, complete separation from offenders should be guaranteed but unfortunately Korea lacks laws that allow this separation. To deal with this matter, the Korean society has been doing its best to prevent dating crimes and ultimately punish culprits. Police departments nationwide have created a special investigation unit that specializes in dating crimes and have even confirmed areas where abuse cases have been repeatedly reported. Additionally, the government is working on solving this social problem by establishing the ‘Gender Abuse Prevention Law’, as an objective of its five-year government plan. Still, despite all the efforts, a more secure law needs to be developed in order to cope with diverse possibilities. To ultimately reduce the crimes of dating abuse, both personal and social actions should be taken. On a personal level, there are three notions that need to be kept in mind. First, it is important to know the correct definition of dating abuse. 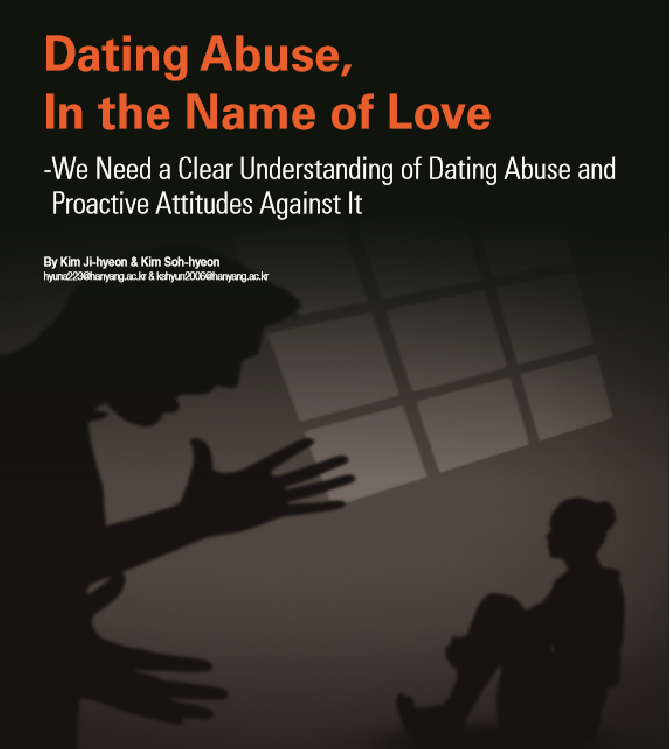 The public needs to know that dating abuse does not only include physical abuse. Comprehension on the correct definition of dating abuse will help determine if an action of one’s partner is or is not abusive. Next, the way the society perceives dating abuse should change. It is easy to regard it simply as a personal or emotional issue. However, dating abuse should be considered as a serious crime because it not only hurts those involved both physically and mentally, but also could be linked to future domestic abuse. Last, the role of bystanders is important. The activist Son said, “For victims, it is difficult to ask for help because they are afraid of negative responses. Therefore, it is important not to condemn the victims but rather try to understand their situations and let them know that we are always ready to help them.” A male HYU student, who asked for anonymity said, “One of my friends once experienced serious dating abuse. We tried to help her by searching for methods to punish the guy. Although she did not take any legal actions because she did not want the case to be opened, we tried to understand and help her. She later told us that our help meant a lot to her. On a social level, the enactment of a dating abuse law should proceed. In general, the content of the law could be divided into two types; additional punishment for perpetrators and protection for victims. These two categories can essentially prevent a crime beforehand. “Basically, to additionally punish the perpetrators, there needs to be a standard to judge if the relationship is a romantic one. However, since it is not legally defined, it lacks logical reasons for the additional punishment. Therefore, for the future law, it is important to put emphasis on the protection and prevention,” said Professor Lee. disorder.” Professor Lee especially emphasized the importance of preventing childhood experiences of any type of violence and helping those who have suffered. Careful watch and aid from schools and the government are also necessary to reduce the crime rates. Currently, without legal restrictions to punish the perpetrators or protect the victims, it is hard to resolve dating abuse. Luckily, the current government has promised to reinforce government responsibility regarding gender violence. As this develops, all members of the society need to keep an eye on how solutions regarding dating abuse work out. “I think a healthy romantic relationship is respecting one another rather than trying to control each other,” said the same anonymous male HYU student. Respect is the foundation of love. However, sometimes people commit violence in the name of love too. People get hurt or even die, under the fabrication that their emotions were for love. Yet, it is important to understand that violence, even in the name of love, should never be justified or accepted.